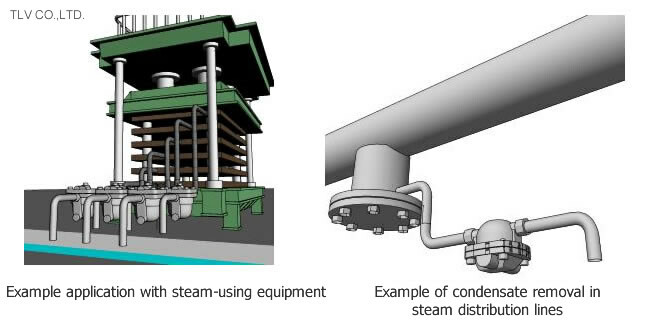 A steam trap's most important job is to quickly discharge condensate that has formed in steam distribution lines, steam tracers, and in steam-using equipment. A steam trap must also be able to save energy by preventing steam leaks and by discharging non-condensing gases such as air. Steam traps are classified into different categories based on their construction and operation principles, and there are several different models of steam traps. Consult the links below to narrow down your choices and find the steam trap that best suits your purposes. Detailed information on choosing steam traps is provided on the pages linked above, so those details will be omitted on this page. This page explains the type of applications that each variety of steam trap is suited for to inform your choice of trap. Mechanical steam traps (also referred to as “density traps”) include Free Float®, lever float, and inverted bucket steam traps. Mechanical traps operate by utilizing the difference in density between steam (or air) and condensate. There are two varieties of thermodynamic steam trap: the thermodynamic disc and piston types. Thermodynamic steam traps operate by utilizing the difference in kinetic energy between high velocity steam (a gas) and slower moving condensate (a liquid). These include bi-metal, balanced pressure, and expansion thermostatic traps. Thermostatic traps operate by utilizing the difference in temperature between condensate that is close to steam temperature and sub-cooled condensate (or low temperature air). Free Float® steam traps are typically the first choice for removal of condensate from steam-using equipment, steam distribution lines, and high temperature tracing applications. A Free Float® steam trap can immediately discharge condensate when it enters the trap body, thus preventing condensate build-up and reducing the risk of water hammer in the steam distribution line. These traps increase the operating efficiency of the equipment by enabling steam to contact all of the heat transfer surface area. Additionally, Free Float® traps are highly energy-efficient because the valve discharge orifice is covered by a constant water seal, which prevents steam from leaking out of the trap body. In contrast, inverted bucket type traps typically include an internal weep hole to bleed off steam (or air) continuously and with each cycle. The weep hole is usually small enough to prevent significant steam loss, but it removes only a limited amount of air, which can hinder system start-up or heat transfer on equipment. Additionally, the intermittent action of the inverted bucket trap makes it typically respond slower than the Free Float®, which operates immediately due to its self-contained buoyancy over water. Unlike Free Float® steam traps, which are designed for the float ball to rise completely out of the path of flow through its orifice, lever float traps typically pull their valve head back from the seat. Flashing condensate passing through the orifice may pull the valve head towards the seat, reducing the lever float trap’s flow or causing intermittent flow. For these reasons, the Free Float® is the most advanced design of mechanical steam trap. Free Float® and lever float steam traps are the only types of trap that constantly contain both steam and condensate in the body. Since steam is always present, these models are suitable for service in freezing conditions, provided that the discharge drains to atmosphere and that the body does not deform from freezing. Conversely, inverted bucket traps must maintain a suitable water seal at the bottom of the bucket, and so these types can be prone to freezing damage. Disc-type steam traps are compact and suitable for a wide pressure range. They are commonly used for steam mains drainage or high temperature tracing discharge. However, Free Float® traps are more energy efficient and durable in the same services, so typically disc traps are recommended as a second choice in those applications. However, there are several applications where disc traps are recommended as a first choice, and one of those is extreme high-pressure steam mains drainage service. Certain Free Float® traps can be used at high pressure levels of up to 12MPaG, but TLV offers disc-type models that can be used at a pressure level of up to 26MPaG. For this reason, disc-type traps are used in severe high pressure conditions, such as with supercritical steam/condensate service. Additionally, facilities where there is a risk of freezing sometimes use disc-type traps. Those disc traps are installed in a vertical down position, as condensate does not pool inside the body when installed in this position, thus the trap is unlikely to freeze. However, this type of installation can shorten disc trap life significantly from increased cycling. Note that if a steam trap is at risk of freezing, then the more serious issue is that often the line itself can freeze too. Facilities that are interested to mitigate freezing damage must ensure that the lines are drained at shutdown. TLV generally recommends Free Float® steam traps for removing condensate from steam-using equipment, steam distribution lines, and high temperature tracing. However, for tracer lines where the product needs to be kept at a lower temperature than the temperature of steam, bi-metal, expansion type, or specially-filled balanced pressure thermostatic traps are useful, as these traps can reduce the discharge temperature by sub-cooling and backing up the condensate into the line preceding the trap. In tracer lines, correctly located and installed sub-cooling thermostatic steam traps can transfer all of the available latent heat plus some sensible heat from condensate into the product. By utilizing this sensible heat, thermostatic traps provide high operational efficiency and help to conserve energy. There are some models of balanced pressure thermostatic traps that are used to drain steam-using equipment, steam mains or high temperature tracing lines, but TLV does not recommend these applications as a first choice because the other trap types listed above are more effective in drainage service. Thermostatic steam traps are also commonly used as air vents in steam systems.